The extraordinarily prolific John Smeaton was one of the first people to call himself a civil engineer. He laid the foundations for the profession of civil engineering, as well as establishing consulting engineering and defining the role of resident engineer. His career mirrored the developments of the Industrial Revolution in Britain. 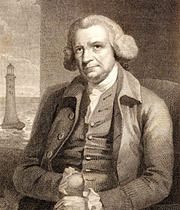 Smeaton's achievements and interests were wide-ranging  from scientific instruments to steam engines, canals to harbours, bridges to lighthouses and mills to astronomy. His most famous work is perhaps Eddystone Lighthouse but he had notable successes with at least 35 other major civil engineering projects, including the Scotland-spanning Forth & Clyde Canal, Ramsgate Harbour and Perth Bridge, plus over 60 mills and more than 10 steam engines. Always wanting to know exactly how things worked, Smeaton spent hours making and testing models of his schemes. He recorded everything meticulously in his diaries and produced copious drawings and reports, many of which survive. He was always happy to explain or demonstrate his ideas, pencil or tools in hand. He continually refined his designs and once convinced that he was right about a concept, would stick to it with some determination. John Smeaton inspired people  whether site labourers or learned colleagues  and always led by example, never asking anyone to do something he would not attempt himself. His recognition of the need for a multi-skilled approach to problem solving made him a pioneer of engineering. 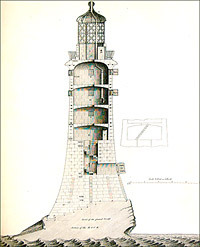 A section through Smeaton's Eddystone Lighthouse  probably his most famous work, and an extraordinary achievement for 1759. Its design influenced successive lighthouses for the following 150 years.